ThinkPad. The name ought to ring a bell. It's the quintessential business laptop that everyone has almost certainly seen, very likely used, and possibly owned during the past decade. Originally an IBM product, the ThinkPad line was sold off to Lenovo (along with the rest of the IBM PC division) about six years ago. Despite the change in ownership, the core product remained the same; love it or hate it, ThinkPad is the standard bearer for Lenovo laptops. Today we're looking at the latest representative of the ThinkPad Classic series, the T410. 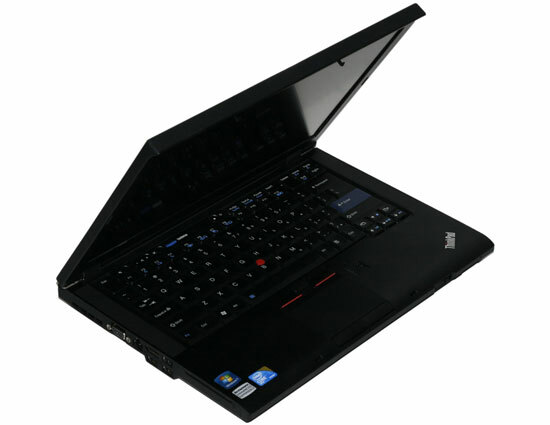 The construction of the T410 has the famed magnesium alloy chassis with a black rubberized coating on the exterior. It's a solid construction that has proven itself time and again—a friend of mine has a similar ThinkPad design from before the Lenovo buyout, and that Pentium M product is now running Windows 7. ThinkPad's are extremely durable, even if they may not be quite as flashy as other laptops. Case in point, hinges are something that often wears out over the course of a laptop's lifetime, and the classic ThinkPad has shown itself to be very durable, even after more than five years. The T410 also continues the trend of having a latch for the cover, something that many laptops and notebooks now omit, and you can open the LCD past 180 degrees and have the display lie flat on the table if that's something you find useful. Even with the solid construction, the ThinkPad T410 still checks in at a relatively light 5.0 lbs. with a 6-cell battery; Lenovo sent us a 9-cell battery to boost battery life, which adds a few ounces while improving battery life by ~50%. 5.0 lbs. certainly isn't going to win the prize for the lightest laptop, but put in perspective the T410 also packs in a speedy Core i5 CPU with a discrete NVIDIA Quadro NVS 3100M graphics card. The construction is also a bit thinner than previous ThinkPad designs, with a flat profile that packs away nicely into a laptop bag. The beveled edge on the palm rest makes the design work without creating a hard angle where your wrists would rest. The speakers are reasonable but not overly loud, but at least they don't distort at higher volumes. ASUS' N61J has some great built-in speakers, but the T410 will work for office presentations in a conference room. If you need more volume, external speakers are the way to go. The fast CPU and discrete GPU improve performance but also require additional cooling, and the cooling is one area where the T410 excels. Even under maximum load, the fan remains exceptionally quiet compared to the competition. Where plenty of other notebooks will hit 40-42 dB under full load, the T410 in testing topped out at just 33 dB—very impressive considering we're looking at a unit with an i5-540M CPU running at 2.53GHz (with Turbo Mode hitting up to 3.066GHz). If you want a bit more performance, the i7-620M (2.66GHz with 3.33GHz Turbo) is an available upgrade for the T410, showing just how well the cooling works. At idle, the T410 hovers right around the 30dB noise floor of our testing environment. The chassis also remains generally cool, with the hottest spots staying under 38C (100F) during testing in a 20C (68F) environment. To put this in proper perspective, the T410 is actually quieter and cooler than most of the CULV laptops we've tested! The standard pricing on the ThinkPad T410 is higher than competing laptops, but you definitely get better quality. The catch is that right now (through the end of the month), Lenovo has some pretty massive sale prices available—around 25% off! The laptop we received for testing (with extras like the 9-cell battery, fingerprint scanner, webcam, Intel 6200 WiFi, Gobi 2000 3G mobile broadband with GPS, and Bluetooth) normally sells for $1900, but with $446 in savings it's currently available for $1454. If you drop some of those extras like the Gobi 2000, you can easily get the sale price under $1300, or with the base options the T410 with i5-540M and Quadro NVS 3100M starts at $1535 (on sale for $1089). That's a great price for a laptop with some high-end features and a excellent design, but you'll definitely want a few upgrades like 4GB RAM. The base model T410 without discrete graphics starts at $1265 (on sale for $919), but again with extras like 4GB RAM, a 6-cell battery, WXGA+ LCD, fingerprint scanner, and 2MP camera it comes to $1430 ($1084 sale price). We'd like to see a standard warranty that's longer than one year, but Lenovo provides extended warranty options at a reasonable price. A 3-year warranty with ThinkPad Protection (2-way shipping provided) is normally $199, but is on sale for $149; adding onsite support will bump the price up another $100. Ultimately, the ThinkPad T410 isn't what we would call an excellent bargain, unless you can jump on the current sale; either way, you definitely get a high quality product. If you're tired of cheap, plastic cases and hinges that wear out after a couple years, we're confident the ThinkPad T410 will last a long time. As mentioned earlier, the ThinkPad aesthetic is something that you likely either love or hate, and I fall into the former category. If I had to buy a laptop for my own use and I wanted something powerful and durable, the T410 would be near the top of my list. I'd prefer a bit more GPU horsepower to go with the i5 processor, and NVIDIA's Optimus Technology would cement the deal. The reason is simple: Quadro NVS 3100M just doesn't pack quite enough oomph for my purposes, but when running on battery power Intel's IGP is sufficient for my needs, so some form of switchable graphics would be perfect. (The T410s adds switchable graphics but not Optimus and it still uses the relatively underpowered NVS 3100M, and it costs several hundred dollars more than the T410.) Finally, while the LCD resolution and matte coating are great, the contrast ration is disappointing. Those complaints aside, there's still plenty to like, so if you've been looking for a reason to buy a ThinkPad, the current sale makes now an excellent time to take the plunge. With ~25% savings on a high quality product, what's not to like? I own a T61 since 2 years and I like it, especially the keyboard. If only I could get something like that for my desktop! However, the machine is far too noisy for my taste (7.2k rpm HDD and/or fan on lowest setting) and the screen is a completely rubbish TN. I love that it's matte (a main reason I chose a Thinkpad), but the viewing angles are so bad that the colors change upon the slightest head movement. If NEC can give us excellent 23" TFTs for 300€ I fail to see why 1000+€ laptops all have to have crappy displays. I'd agree about the screen... I would have thought it would have been fixed by now. One of our guys has a T61... and it is very sharp, looks good. But when put an SL-500 or my R61 next to it, then it looks very bland for no good reason. I've been working on a ThinkPad T60 for the past two and half years. My experience - the best keyboard and /the/ worst LCD screen anywhere. I understand that PC manufactures have to cut corners somewhere, but 1200+ dollar notebook should have a better screen. My 4 year old Clevo M660 machine has above 400:1 contrast ratio (LG/Philips matrix). It is not very bright around 140 Cd/M2, but is a very nice screen. I bought it for 650 euro (800$), so I think there is room for better screen in 1200 dollar T410.